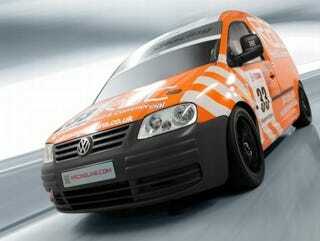 VW Caddy TDI Van Competing In Volkswagen Racing Cup! First we checked it wasn't April 1st, then decided after news the El Camino is back, again, this is probably the coolest story of the day: a VW Caddy Diesel Van will be competing in the Volkswagen Racing Cup! Diesel delivery van racing. Savor the brilliance of that idea for a moment. Mmmm, delicious. The VW Caddy TDI has been sponsored by the Royal Automobile Club to race in the Volkswagen Racing Cup with it's first race happening at Oulton Park, Cheshire, UK starting April 3rd. The van's been tuned for competition by RacingLine with race-centric suspension adjustments and an engine tuned 256 HP and over 368 lb-ft of torque. If you think about it for a second, it's actually a pretty genius idea if the little bugger can be competitive, vans have got WAY more advertising space than Jettas. Hopefully they put some shag carpet down on the dash and a mini-fridge in the back.